The LifeSize X is a stylish multi-touch table made from robust steel making it suitable for high traffic areas, such as receptions and showrooms. 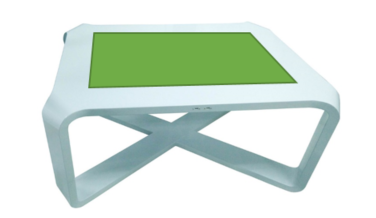 The tables have an integrated quad core Android PC, ideal for installing apps from the Google Play Store. Standard height is 41 cm, coffee table height. A standing height version is available as an alternative. 32” multi-touch display, using projected capacitive touch (edge to edge glass, with no bezel compared to cheaper infra-red touchscreens). 1920 x 1080 resolution. Android Quad Core PC integrated. Product measurements 100 x 64 x 41 (l x w x h). To get pricing and availability for the LifeSize X Table or any of our products, please call us on 0151 8080 180 or get a fast quote via our enquiry form.